Capt. Sensible is far too cheery a guy to play on that team. Maybe you could get Trent Reznor to substitute? I couldn't agree more. I see Trent as midfield enforcer. And I'd have Pete Murphy and Jaz Coleman in there as well. I can't believe no-one got my Captain Sensible joke. I workshopped that joke for 6 months. All right, Reznor's in but only due to injury (not self-injury you understand, that would rule him out). We'll try him up front though, we need his speed to outpace Ricki Lake. The Captain called. He said "Wot?" Rozz Williams isn't on the "injured" list? I got your "sensible" joke (and I chuckled), but I'd have put "Sensible, Capt (capt.)" personally. You have to really hammer the joke home sometimes, I find. Eldritch managing Hussey? I sense trouble brewing. They'll only play one album... erm, fixture... with that lineup. I once saw Smith, Robert playing football with his,umm, "roadies" in New Zealand. I also sat near Siouxsie on the 227 bus, but that is just gratuitous name dropping and nothing to do with football. LOL. 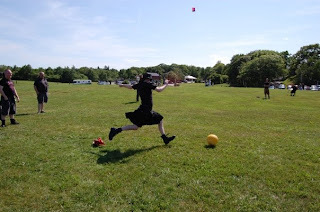 That's kickball at Goth Fly-a-kite! Even wussier than soccer. 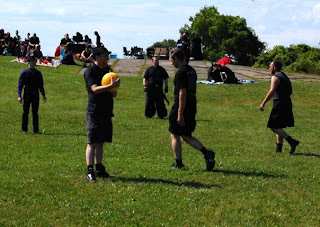 A lack of goths in sport? You clear have never heard of roller derby.